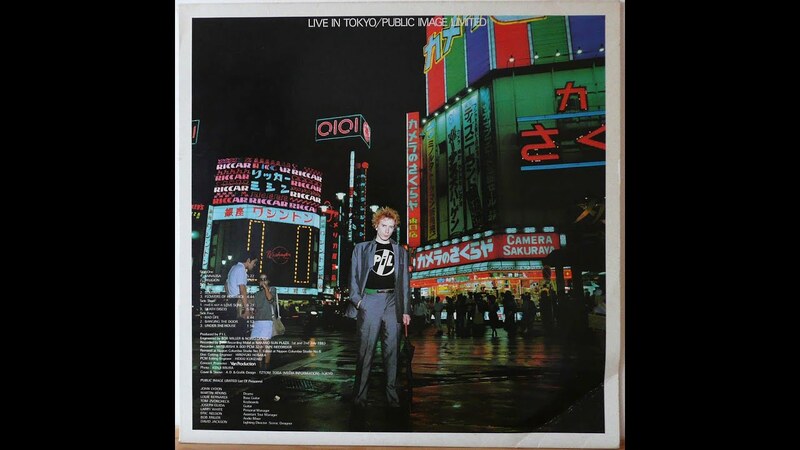 PIL "live in tokyo" Jacket at shinjuku sta. you like rock music or and so on. - I say proper evaluation, cos I love it. but if you live in a countryside boy or girl, why you like to go to shinjuku gyoen to have green? you want to see what is Japanese city, there is no reason to go there. Best time to go there, when you have some tiresome in noisy and or anything in tokyo city. - sorry , not been there, and not interesting in jazz. - I say not proper evaluation, I think. why you like to go to Okinawa (south island) in shinjuku. and they might recommend Okinawa soba (Okinawa noodle) and so on, but I would recommend very variable and many attractive "Ramen". - sorry , not been there, and not interesting in cats. - I like this shop, I go there sometime but, I say not proper evaluation, I think. far from shinjuku Sta. and if you want to have experience of Japanese bread shop, not far from shinjuku sta. there are many many bread shop in basement of a department store just like isetan or keio or odakyu or anything. 2 chain store in 1 place that's it. - sorry , not been there, and not interesting in whiskey. - I say proper evaluation, cos I love it, very near to Shinjuku gyoen. but shinjuku gyoen is cllosed at 16:30, so you want to here and there, I recommend lunch time. - sorry , not been there, but why you are in shinjuku, I say to you. - I like this place, I go there sometime. But you might think japanese like batting in Nightlife district. reason why? I talk about this, my opinion comes out. In old days, baseball is most popular sports in Japan. baseball was only entertainment in japan. do you remember "crazy climber"? If you are around 40years old , you might have played a arcade game "crazy climber". use 2 joystick no button I thought it revolutionary though I was young . I loved crazy climber as much as "packman" , I loved arcade game and used to play at Oslo batting center at kabukicho when I was young. It is a real story of crazy climber that came out from a company at Shinjuku Ookubo. One day a worker of a game company took a glance at window through Shinjuku skyscraper, that came up with a game climbing skyscraper. crazy climber got a hit in global after that.... as much as packman. You might think I can't help mentioning "Ramen". Ramen is very popular food in Japan and very reasonable so that nonnative love it. But it might be very difficult for nonnative around shinjuku or shinookubo to enjoy it , I think. and I mean not all ramen shop are good and it is a little hard to order it. ★Ramen are categorized for many . but very "normal" in Japan it calls " Futsuu". So I cannot describe here my recommendation. And ordinary Chinese restaurant get fewer nowadays. -nowadays only dried fish soup stock ramen is few but very traditional in Japan. my recommendation is "Nagi" at otakibashi-dori near by Okubo Sta. (not Shinookubo Sta.) or hanamichi @kabukichou. - nowadays mainstream of shouyu ramen is this type. - Kitakata ramen near by seibu-shinjuku Sta. kanji and kana character is " 喜多方ラーメン"
- Musashi at otakibashi dori near by nishi-shinjuku Sta. kanji character is " 武蔵"
kanji character is " 羅偉伝"
- Misoya hachiro shouten at otakibashi dori near by nishi-shinjuku Sta. kanji character is " 味噌屋八郎商店"
- nowadays my recomen' is not near here (around shinjuku). - nowadays my recommen' is not near here (around shinjuku). - sorry I don't like jiro-kei and I advise you had not better choose "jiro-kei". jiro-kei is very "eccentric" I think. Most of all ramen shops order systems are meal ticket system, Japanese " Shokken", character is "食券". It is not easy for beginners and nonnatives, so you have to say bravery when you put money in machine.
" Suimasen osusume wo kudasai, Oshite morae masuka". suimasen is "excuse me (or us)"
Oshite morae masuka " please push bottom "
you say so, clerk may come over and push bottom with appropriate. Then clerk says to you sometime. "okonomi wa arimasuka?" means what is your favorite or anything? When you might be a beginner you have to say " Futsuu de iidesu" . To order is that's it. and all you do is sit and wait and eat. after you ate , sometime you have to bring your bowl to higher counter, it depends on shop. I love Ramen , what can I do of you. "I dare to make you go sightseeing to shin-ookubo"
-what is attractive about shin-ookubo? -Is it worth to go to shin-ookubo? about shin-ookubo, I make you touch with shin-ookubo. where you are ? you are at shinjuku-sta. ? now you're making plan about shinjuku-trip or anything else? you haven't decided where to stay at shinjuku? that is "shinjuku green plaza"(hereinafter"green plaza"). catch copy is "is not luxury but comfortable ever-met"
So here is a most popular culture of Japanese,"Capsule Hotel"! You can stay in mid-shinjuku for about 20 bucks a night. (is a personal opinion ). -tattoo is not allowed, so you have it, before you be in, talk about any treatment they can (I mean , you have to make a offer to counter clerk), just like bandaided or any taped in your body. -when you are bathing, don't wear pants. -when you are bathing, your towel must not soak in big bathtub. when you decided hotel to stay in shinjuku, then how you enjoy in shinjuku or shin-ookubo and also. next time I write　more.